I have read two books – partly because I have little else to take my attention at the moment and partly because they are really good. They are about human beings. All Is Grace is a memoir by Brennan Manning. Born in New York, he was an Irish Catholic by lineage rather than faith. As a young man he wrestled with a drink problem, although he functioned well enough to hold down a job and then attend college before dropping out to join the Marine Corps. He was a prodigous drinker. Most nights he would drink “a dozen or so beers, a pint of rye whiskey every other day and often a litre of sake a week”. His friends called him Funnel. When he meets God, it hits him like a train and I’m not sure I have ever read such an unapologetic, deep rooted description of a man enthalled by the Grace of God. He joins a monastic community, becomes a Catholic priest, gets married (therefore no longer a Catholic priest) gets divorced. And all the time, his life was marked by persistant lapses into alchololism. David by John Hercus is a very different type of book but it reinforces the same message. Written in 1967, the writing style is a bit Enid Blyton. (This is obviously not a bad thing). But his analysis of David the man is spot on I think. Yet, I think I am at fault here (always a first time I suppose) I think when I read about David, I think of him as a kind of cardboard cut-out. King of Israel, Great Warrior, Gods Own Heart etc etc whereas, he was a human. As human as me or you or Brennan Manning. John Hercus writes about David’s childhood which was messy and loveless. (Have you ever wondered about how a young boy felt whose family had no use for him so spent his whole life alone watching over sheep) He was completely ignored when Jesse was asked to bring his sons to meet the prophet. Hercus writes admiringly about David’s loyalty in staying on the run so that he would not find himself in a situation where he had to kill King Saul. But he also writes about his ruthlessness – both in battle and as a King. He looks at some of the Psalms that David wrote and points out the lack of self knowledge in them sometimes. The passage where Nathan confronts him with what he has done with Uriah and Bathsheba is particularly good. It’s written like a thriller – where everyone knows what David did, just who will have the guts to say so. These are very different books – different eras – different approaches but blimey – the men involved. And they are men, permanently flawed, sometimes completely useless, sometimes amazing but what they had in common was they realised their worth before God and lived their lives following on from that understanding. I’m no expert – on anything really – but I wonder if more of us (by more of us – I mean me) were able to live in front of God in this way – open, honest, passionate and unwilling to allow our flaws to stop us being loved completely by God, how much clearer would our vision be and how much more would we be able to achieve. 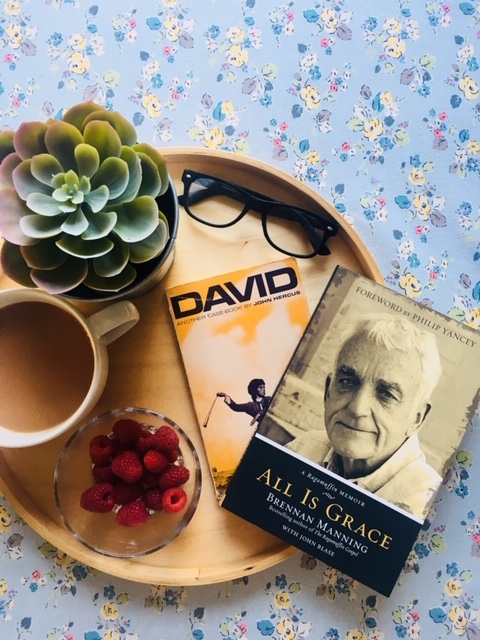 My battered copy of “David” was a gift from my wonderful and wise parents 50 years ago, I was 14, recently baptised, an enthusiastic teenager . I can still quote bits of the book from memory. It helped, inspired and challenged me through adolescence and student years., and later as a young wife and hassled mother. .. And now I am getting to be really old, I think I should read it again. I love books like that – that run through your life. I loved it. I saw David in a completely different way. I had never thought about his childhood before. Also seeing him as a complete human – and adored – as he was – just lovely. It may amuse you to know that I read Brennan Manning as Bernard Manning and had to do a double take!! Ha ha brilliant. That would be a very different book – although maybe Bernard had a side to his personality that no-one knew about! “All is Grace” is one of the best books I’ve ever read. Totally at peace with his place in God’s Grace – if almost nothing else.